Prior to 1928 our circulating currency was 40% larger than the notes we use today. These large sized currency notes are very collectible today because of the novelty and the appeal of the designs. Large size currency was more ornate and some beautiful designs were produced, especially in the 1870's to 1890's. Large currency is sometimes refferred to as "Horse Blankets" for obvious reasons. The second note from 1928 is the same size as modern currency. that advertized a business and informed the public about the change to smaller currency. Here is an example of an ink blotter advertising piece. You might wonder, if the currency was larger were the wallets also large? The answer is yes. 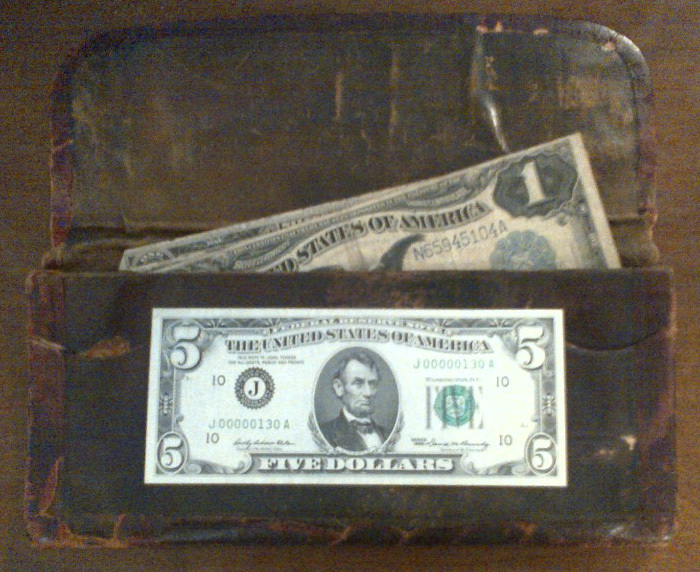 Here is a picture of a wallet from about 1905. Notice how large it is. This would be called billfold. I have put an image of a modern note in the picture for comparison.